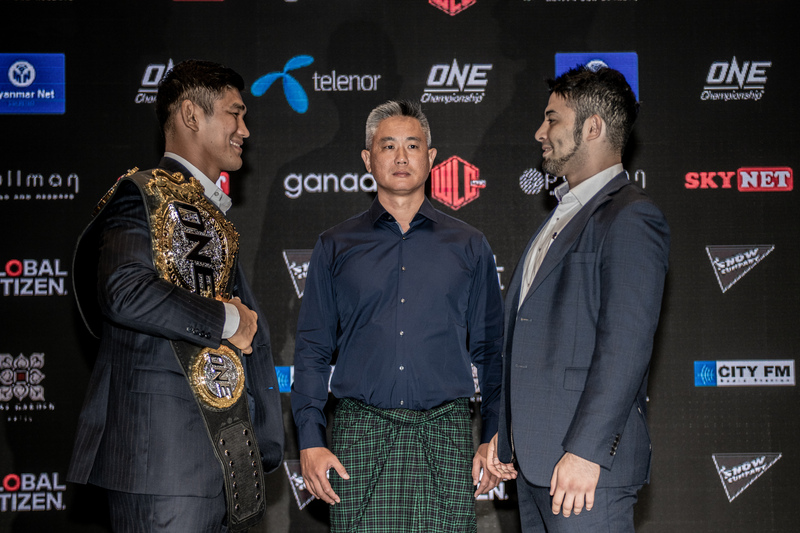 Reigning ONE Middleweight and Light Heavyweight World Champion “The Burmese Python” Aung La N Sang, 33, of Myanmar is facing Ken Hasegawa, 31, of Kanagawa, Japan in the ONE Championship cage for the second time. Their rematch is one of the three title bouts at “ONE: A New Era” at the Ryogoku Kokugikan in Tokyo, Japan on March 31, 2019. The first encounter between Aung and Hasegawa was the main event of “ONE: Spirit of a Warrior,” which took place at the Thuwunna Stadium in Yangon, Myanmar on June 29, 2018. It was a five-round thriller of epic proportions, one which the Burmese defending champion won in the final moments of the heated battle. Considered the greatest bout in ONE Championship history, the bout between Aung and Hasegawa was named Bout of the Year at the 2018 Global Martial Arts Awards for its nonstop action and dramatic finish. Aung is the most iconic sports superstar to hail from Myanmar. “ONE: New Era” marks the first time he is defending his title outside his home country. “ONE: New Era” is the first ever ONE Championship event in Japan. Aside from the rematch between Aung and Hasegawa, the fight card has two other title bouts. Shinya “Tobikan Judan” Aoki, 35, of Shizuoka, Japan will challenge reigning ONE Lightweight World Champion Eduard “Landslide” Folayang, 35, of Baguio City, Philippines. It will be a rematch between the Filipino defending champion and his Japanese challenger, who is a former ONE Lightweight World Champion. Reigning ONE Women’s Atomweight World Champion Angela “Unstoppable” Lee, 22, of Singapore will challenge reigning ONE Women’s Strawweight World Champion “The Panda” Xiong Jing Nan, 30, of China. If the former wins, she will become the first ever female two-division world champion in the world. Tickets for ONE: A NEW ERA go on sale December 20, 2018 at 6PM JST and is available on LINE Ticket at https://ticket.line.me/sp/ONEChampionship, Kyodo Tokyo, Ticket Pia, Lawson Ticket and E-plus from January 27, 2019.